Well, the last full day of our vacation in the beautiful OBX is coming to a close. Bittersweet as usual! I'm always caught between "Ahh, it was so nice to relax and do nothing" and "Ahh, there was so much I wanted to do, why didn't we do everything?" But in the end, I just smile and say, "It was a great vacation." I think vacations should be a good mixture of relaxing and going out and doing things. 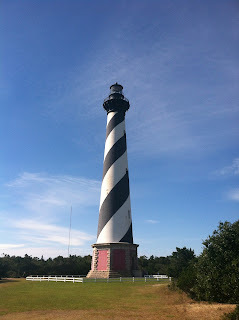 We first stopped in Buxton in Hatteras Village and checked out the gift shop and admired the largest brick built lighthouse while my dad got his permit to drive his truck on the beach. Today was the first day of the CCFW's 27th Annual Fishing Tournament and everyone was out on the beach with their 4-wheel drive vehicles to try to reel in the big one! Between my dad, husband, brother's girlfriend and myself, we managed to only bring in a couple sea mullet, one sheep's head, one spot, and one blue fish. Not to mention my husband reeled in a SKATE! It was really cool! The other fish were just big enough to bring back to the beach house and fry up for dinner. We stayed out on the beach just about all day, snacking on sandwiches made with my homemade honey wheat bread, of course! Despite the sunburn my husband got and not catching any big fish, it was a really good day. Oh and before we drove on the beach, my husband and I went to Super Wings and rescued (ugh, yes, I consider it rescuing...the conditions are awful) two more hermit crabs! Now I have Scarlett, Rhett, and Ashley. Yes...the names are from Gone With The Wind! I LOVE Gone With The Wind...both the book and the movie. If you've never read the book, go get it now! We'll be heading back to the mountains tomorrow morning, but not too early. We plan to take the drive nice and easy and stop at any neat little sites. We saw a bunch of farm markets on the way down so if they're open, I'd love to check some out. But for now, it's off to bed for me so that I can get up tomorrow and hit the road. Wish we were able to stay for two more days like my parents! Maybe next time! It was a wonderful trip, though...so glad we were able to come! What about you? Do you like to constantly check out local events, museums, restaurants, etc when you're on vacation or do you prefer to chill out the whole time? Or are you like me, trying to attain a nice blend?